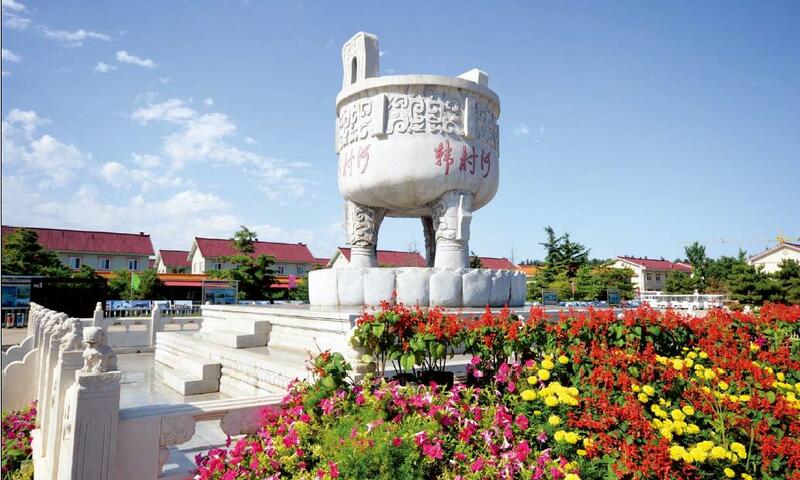 Hancunhe Village, 40 kilometers from the center of Beijing, owns 910 families and 2700 people. Since the reform and opening-up, through seizing opportunities, working hard, insisting to developing collective economy, and pursuing common prosperity under the leadership of old secretary Tian Xiong, Hancunhe Village which suffered from poverty and backwardness before has developed into a beautiful ecotype garden village where the infrastructure is complete, publicinterest facilities are perfect, various industries flourish and villagers live and work in peace and contentment. Hancunhe Village connects various sights and creates a beautiful village landscape with its own characteristics. It has begun integrated planning and construction since 1992. 581 villas in different styles and 21 apartment-style multi-layer buildings which cost 1 billion Yuan create the special building groups of Hancunhe Village over 11 years. Shengxiao Building which marks that Hancunhe Village starts from construction and viewing decks to climb for looking out is special and unique. The exhibition room of construction of socialism new countryside which describes the hard entrepreneurial process of Hancunhe Village shows historical changes of its development. Famous, special, perfect and new nuisanceless vegetables are planted all the year round in high-tech vegetable gardens, highlighting its characteristics of developing agricultural tourism. Hanjian Pipeline (PCCP) base which is famous for carrying on Beijing section of South-to-North Water Transfer has enriched the connotation of tourism in Hancunhe. The Hancunhe resort reference center integrating food, housing, transportation, travel, shopping, entertainment and meetings will provide you with the best places for recreation. 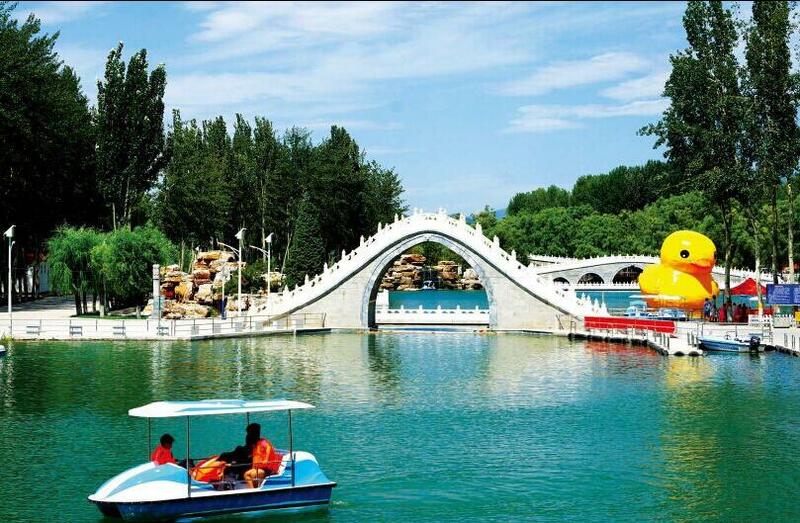 Hancunhe Park which cost 0.2 billion Yuan looks just like new version of Riverside Scene at Qingming Festival. You can see green lawns everywhere; beautiful bridges winds on the lake; clear lake water is within touch; willows dance in the wind; rockeries in various styles are located everywhere; amusement parks are full of laughter; bustling markets lie around the bridges, which helps to relax tourists. Hancunhe Village adheres to enjoying results of reform and development and achieves full employment. Villagers enjoy each kind of livelihood welfare and social insurance free of charge, their incomes have increased year by year, their living quality has been improved and every family lives a happy and harmonious life. The old people over 60 years old are given pensions by the village collective, with 8 Yuan per person per month per year old (i.e. the old people who is 80 years old can get 80 × 8 Yuan, namely 640 Yuan). The village collective buys rural cooperative medical insurance at the higghest level for agriculture-account villagers, and gives allowance to villagers who suffer from serious illness and live a hard life. Every villager can get flour subsidies of 900 Yuan every year. Every retired worker whose account is in this village and is 60 years old and above can get flour subsidies of 300 Yuan every year. The village has established a flower company and special personnel are responsible for greening work all the year round; the forest-cover rate has reached 60%, which creates a perfect living environment for villagers. The newly-built Yunlongge Area owning 5 townhouses and 3 multi-layer buildings are supplied to eligible villagers at cost. Return house payment which villagers spent during the construction of new village to them year by year; give allowance of 5000 Yuan to each villa and 1000 Yuan to each family of every layer every year. The newly-built over 5000 square meters modern central kindergarten provides a better growth environment for children in or around Hancunhe. Implement “coal to electricity” project, and realize “support heating depending on weather” with clean energy; village collective pays for all the heating fee. Implement insulation reconstruction for outer wall of residences, to reach the standard of saving energy and reducing cost. Hancunhe Village represents the epitome of construction of socialism new countryside and the exploring window of natural and social changes, and it has won widespread acclaim of tourists at home and abroad with its new style of new socialist countryside, special beautiful landscape and modern idyllic scenery. It has won more than 146 municipal honors such as “National Advanced Grass-roots Party Organization”, “Model of National Town of Civilization”, “National Agricultural Tourism Model”, “National Grade-AAA Tourist Village”, “China’s Top Ten Famous Villages”, “China Happy Village”, “National Ecological and Cultural Village”, “China’s Top Ten Most Beautiful Villages”. It has also been identified as national training base of practical rural talents by the Central Organization Department and the Ministry of Agriculture.